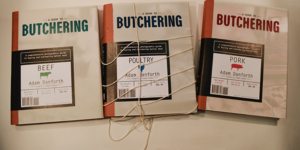 Chefs Collaborative – Ohio River Valley, in collaboration with Turner Farm and Midwest Culinary Institute, presented two workshops with Adam Danforth, who is the James Beard and IACP award-winning author of two books about slaughtering and butchering livestock. He teaches workshops and lectures nationwide for venues such as Stone Barns Center for Agriculture and the James Beard Foundation Chefs Boot Camp. Adam also works with individual farmers who are slaughtering animals for themselves, and because of that, he has a keen awareness of the needs of farmers, especially those who may be killing an animal for the first time. ORVCC presented two workshops sponsored by Whole Foods, Ohio Signature Beef, MadTree Brewery, and Edible Ohio Valley on Saturday, June 17 and Sunday, June 18. After decades of a slow growing disconnect from our sources of sustenance, we’re awakening to the a new reality and looking for ways to plug back into the cycle of food raised on farms before ending up on our plates. The most significant experience in this journey is the moment when you participate in the humane slaughter of an animal. It hits a hard reset on your appreciation for the exchange of life for life from the animals that sustain us. Guests joined Adam for the humane slaughter of a sheep and chickens at Turner Farm. Participants were walked through the entire process, from stun to cooler, focusing on reverence for the animals while gaining a deeper understanding of the methods employed to get the most out of the resultant carcass. This workshop offered hands-on opportunities for those interested. 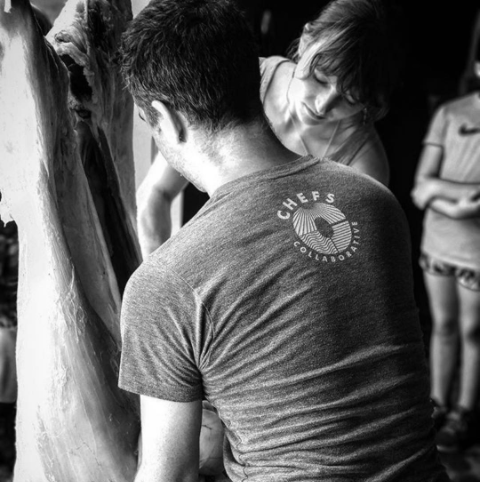 During Sunday’s demonstration, Adam discussed how working muscles render more flavor, the inverse relationship of taste and texture, and why we should be supporting farmers more by consuming their older and cull animals. This workshop included a rundown of meat science and how we experience it as deliciousness, all the while breaking down an animal into primals and cuts. Danforth took an in-depth look into the biological processes that affect the flavor and qualities of the meat we eat. Onsite cooking demos demonstrated techniques to maximize the flavor of these complex meats and discusses the role chefs can play in driving market demand for these new products. A blind tasting allowed participants to explore varying tastes and textures, followed by in-depth discussion of each muscle cut. Proceeds benefitted both Chefs Collaborative and Midwest Culinary Institute.